Sealer Coat is Dry: Start Varnishing! 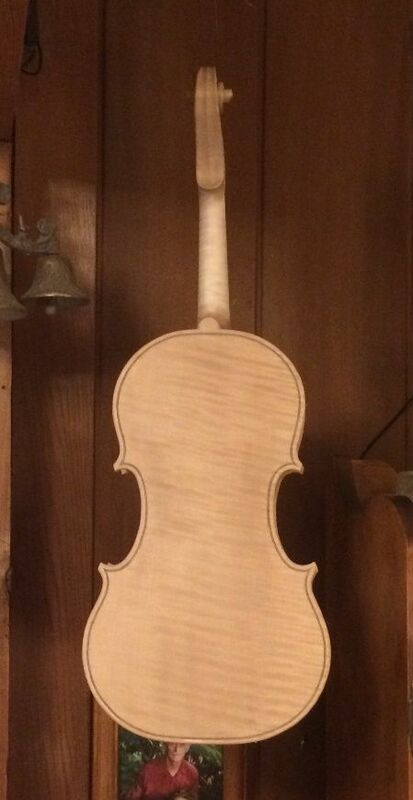 Since the sealer was dry, I gave the violin a careful rub-down with worn 400-grit paper, and began to add varnish. I am using a spirit varnish, the first coat of which was a yellow varnish, which I had actually hoped would be a little more “amber” in color, but I think it will be OK.
First coat of varnish on the Back plate. First coat of varnish on the Side. First coat of varnish, on the Front plate. 2nd coat of varnish, on the Front plate. 2nd coat of varnish, on the Side. 2nd coat of varnish on the Back. 3rd coat of varnish, Front plate. The light was a little better, so it looks brighter. 3rd coat of varnish, Side view. 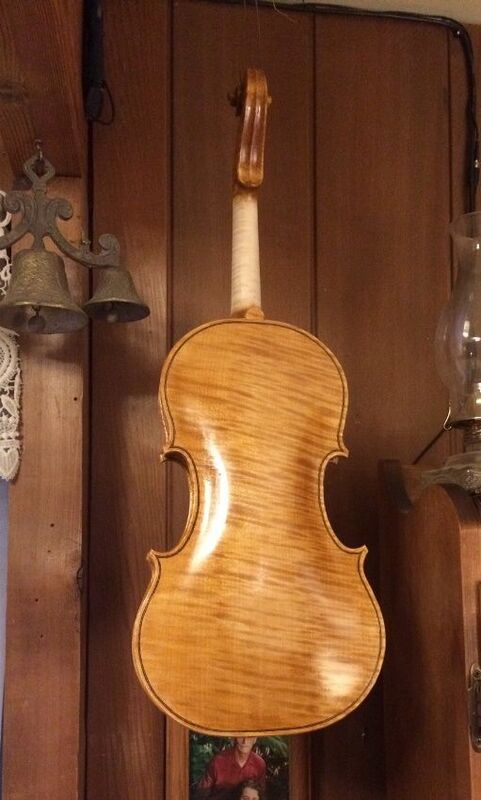 3rd coat of varnish, Back view. The first few coats are thin enough that it is difficult to see the changes…but it is gaining a little more color and gloss. 4th coat of varnish, Front view. 4th coat of varnish, Side view. 4th coat of varnish, Back view. It is pretty obvious, now, even on the ribs, that certain areas are getting less color added. 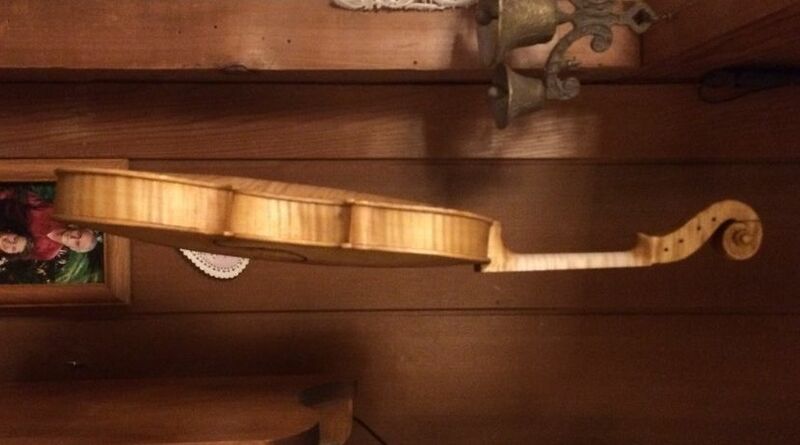 As I explained above, those are the areas that typically get the most wear, so, to imitate the wear patterns on the original instrument, I am minimizing the color added to those areas. 6th coat of varnish, Front view. Lots of changes still to come. 6th coat of varnish, Side view. 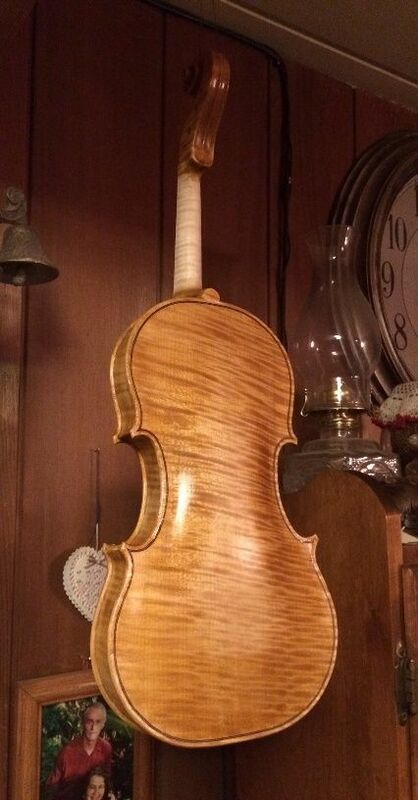 6th coat of varnish, Back view. I gave a careful look to the poster, again, and tried to get the “wear areas” closer to the original. It is still far from accurate, but it is beginning to at least have the “flavor” of the original. My color is still too bright, and some areas still too light, but it is getting closer. Front, nearing completion of color coats. Side, nearing completion of color coats. Back, nearing completion of color coats. Final color, with “dirt” and “age”. The next thing will be to re-fit the fingerboard, dress the fingerboard, and begin set-up. I will continue to address “polish and finish” issues as I see them. 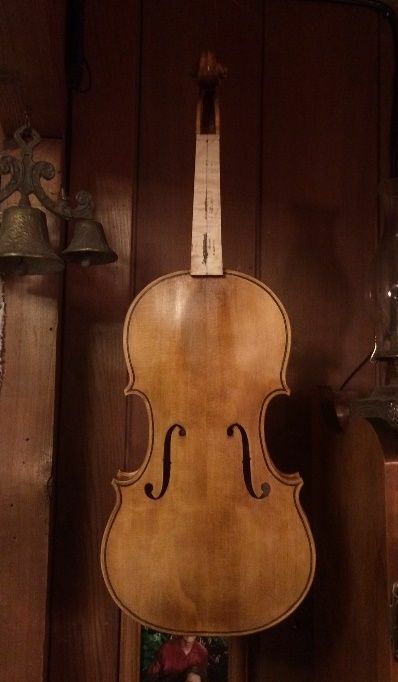 A world-class luthier in Germany (Roger Hargraves) shared this publicly…he accomplished it a little differently, in that he prepared his gypsum by hydrating plaster of paris very thoroughly, and using the carefully washed fines as his filler. 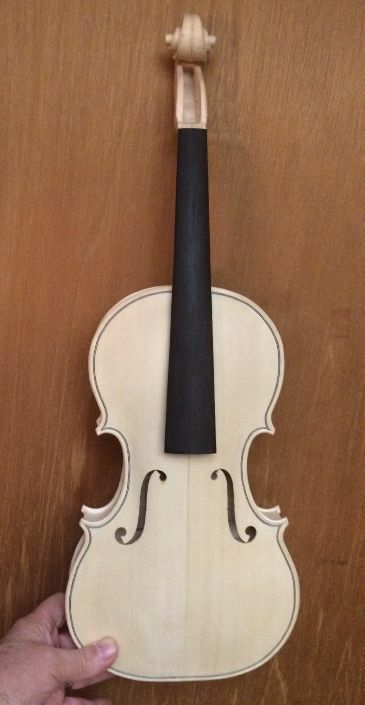 I used the finely-ground gypsum available in gardening stores, stirred it into a suspension of strong coffee and ethanol (only there to keep the coffee/gypsum mix from developing mold, sitting on the shelf), and brushed and rubbed the mixture into the wood of the violin. Then I rubbed it back off, using a soft rag, getting as much as possible back off while it is still wet. 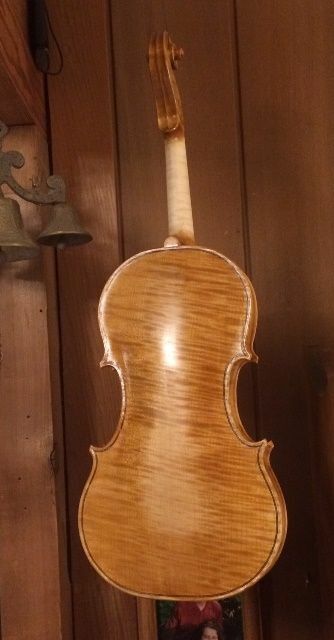 The goal is that the fine particles of gypsum will plug the pores of the wood, so that the subsequent coats of varnish will not penetrate into the wood. I can’t say whether my method works anything like that of Mr. Hargraves. Perhaps someday I will try something else. But for now, that is what I do. 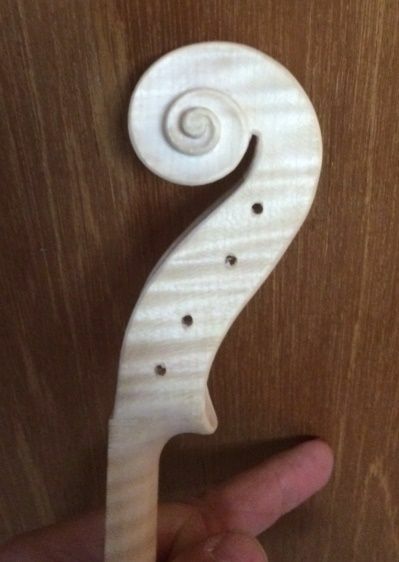 First, I removed the fingerboard, and did some miniscule corrections to the scroll, pegbox and button. Then I painted on the stirred-up suspension, coating everything except the handle area of the neck. Gypsum mixture on the back…still wet, but already beginning to dry. Side view with wet gypsum suspension. Lots of uneven coloration. 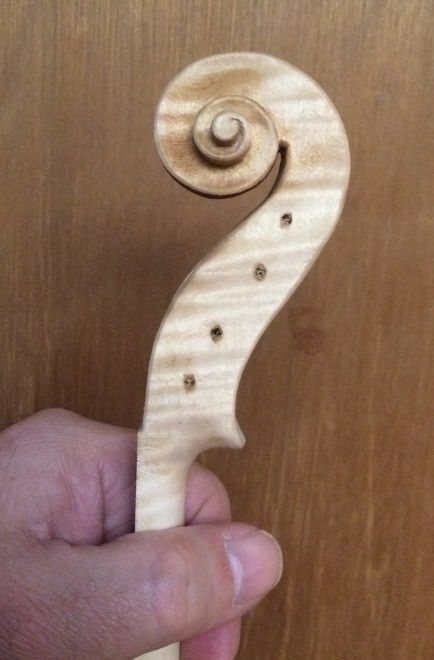 I’m not certain why, and it may present a challenge during varnishing. Not my usual experience. 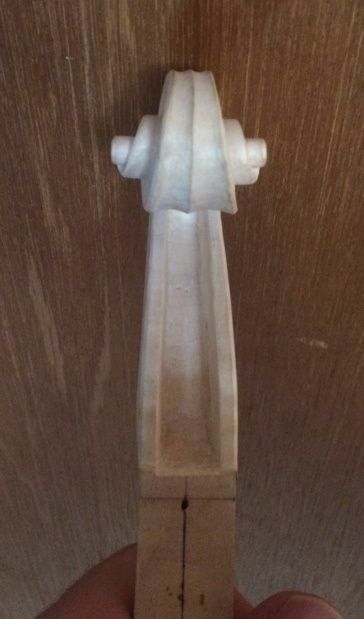 Gypsum on scroll, beginning to dry. Gypsum on back– dry. Notice how the flame is obscured. So…the next step will be to rub off all the excess dry gypsum, and clean up any rough areas where the grain may have raised again. (I’m not really expecting any, but I will be looking for them. Then, tomorrow evening, I hope to apply the sealer that will lock in the gypsum. It is always a little astonishing to me, to see the grain and flame suddenly “pop” out and become very visible. The gypsum becomes completely transparent, and is never evident again. 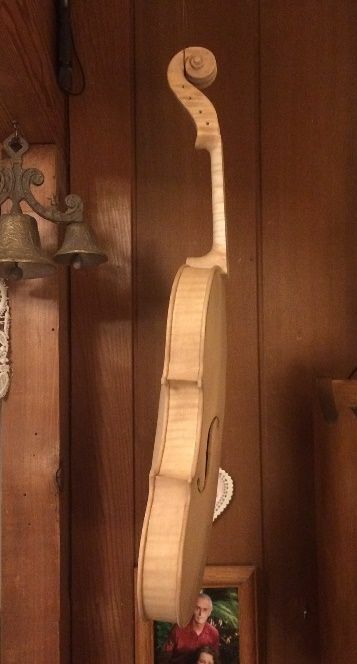 In the last post, I showed the photo of the violin with just the turpentine/pitch sealer coat in place, and not totally dry. Remember that this was applied over a coffee stain, and a mineral ground that I had rubbed into the wood. When that coat was finally dry, I checked for any distortions (from the coffee stain, I guess) and corrected them with plain water, just moistening any low areas with a damp rag, and watching them come back to normal. Since I just barely moistened those areas, they stayed in the correct position after drying the second time. This has been a rare occurrence in my experience, but I was grateful that it turned out to be a relatively easy fix. Then I sanded lightly with worn 400-grit, to remove any bits of loose debris and/or any little fibers of wood that had lifted above the smooth surface. I had already done this after staining (both times), but it always pays to go over things again. 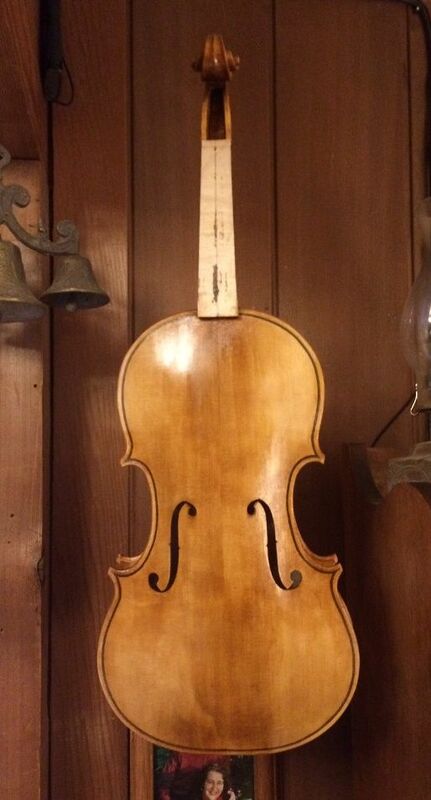 The first coat on this instrument was a very blond spirit varnish; not my usual. I am not entirely pleased with the result, but it is acceptable. First varnish coat, side view. 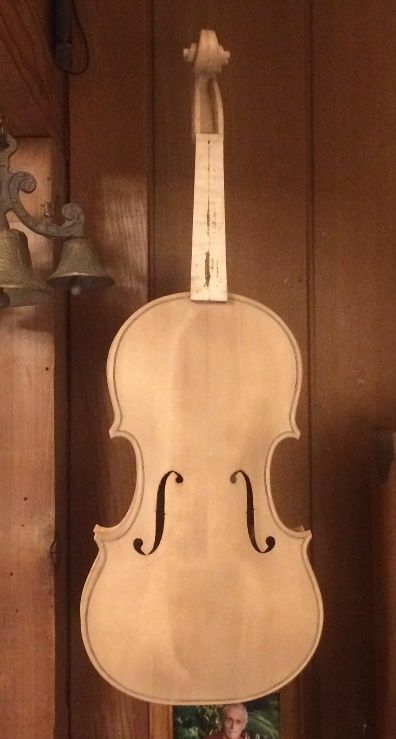 First coat of varnish, back view. I sanded it lightly, again, and then applied a darker yellow varnish. Fortunately, spirit varnish dries very rapidly, so I can sometimes get two or three coats in one day, early in the sequence. As the varnish gets thicker, it dries more slowly. I assume that this is because it can no longer soak into the wood at all, so every bit of the drying has to happen from one side of the varnish film; but perhaps there is more to it than that. 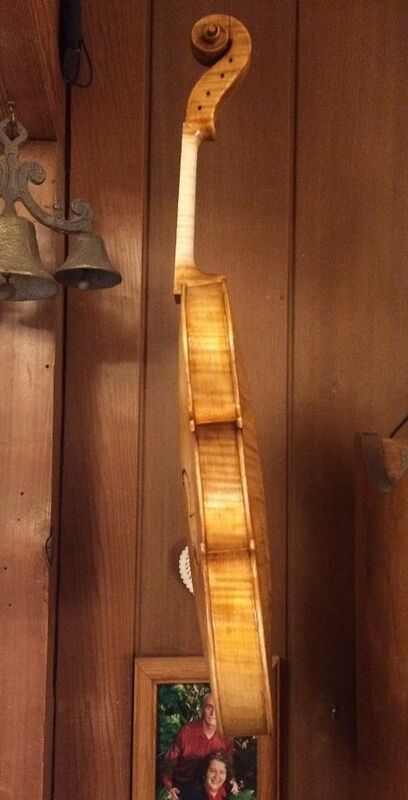 At any rate, as the instrument nears completion, I have to allow longer time for drying. The other side of the “fast-drying” coin (or two-edged sword) is that it is extremely sensitive to the next coat of varnish, as the solvent in the new coat can easily lift the previous coats, forcing me to completely start over, in some cases. I really need to be patient, and work carefully, applying many thinner coats, rather than fewer thick coats. Second coat of varnish– darker yellow– side view. Lots of room for improvement, here– and that is how spirit varnish works. I keep adding color, and “evening things out” until it looks right. Yellow varnish back– still pretty pale-looking, after that second coat. After the yellow varnish dried I began adding (several coats of) a darker red-brown varnish, allowing each coat to dry, and sanding lightly between coats, to make sure the finished result is good. This is the first coat of the red-brown varnish, so, actually the third coat, overall. It will get at least five or six more coats of varnish before it is done, but the differences become less and less obvious, as the varnishing nears completion. I am enjoying looking at the beautiful European maple and spruce. 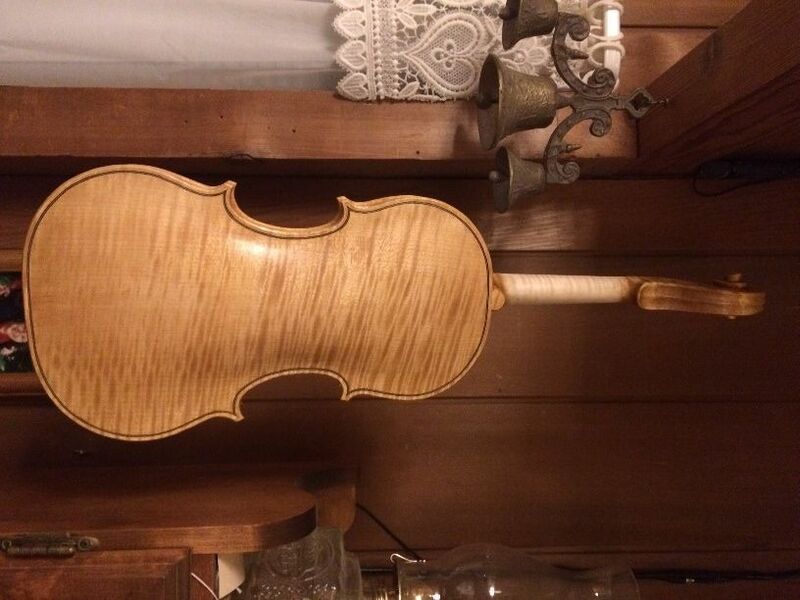 I ordered this wood from International Violin Company, in Baltimore. Third coat, using red-brown varnish. Back, with the third coat of varnish. (Quite an improvement isn’t it?) You can see the brush-marks in the varnish, but they will be sanded smooth before I apply the next coat. 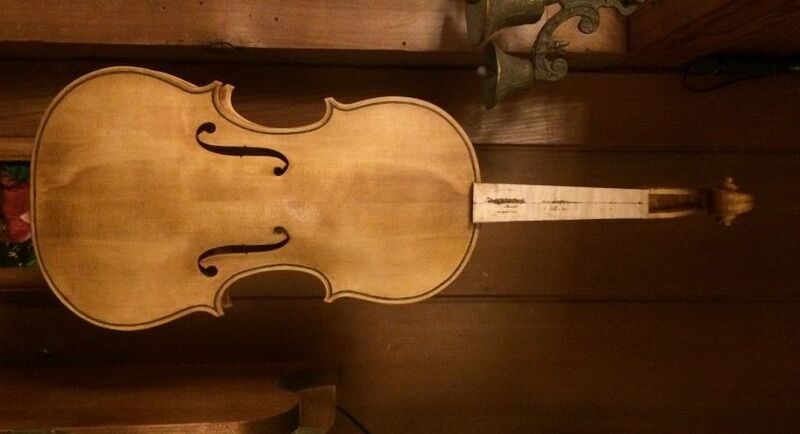 As I continue to add coats of varnish, I am keeping an eye on the general “flavor” of the instrument. I may skip certain areas for several coats, to leave the varnish thin in those areas. 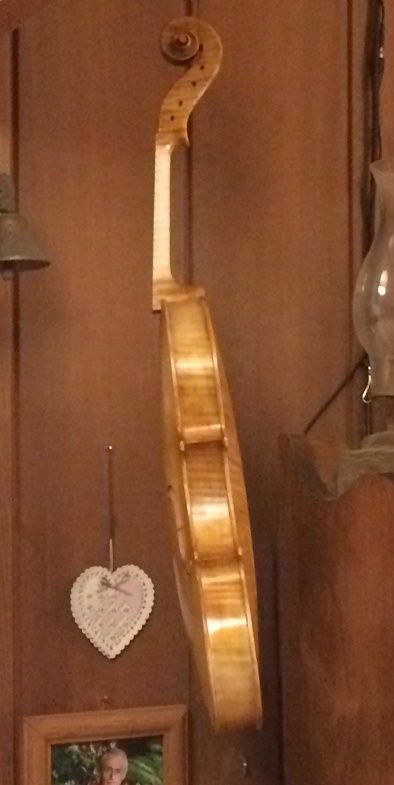 I deliberately try to emulate the look of some of the more gently-used “Old Master” instruments. I am not attempting to “fake age”, so much as attempting to capture some of the charm and appeal of those intruments. If anyone has a question about my motives, all one has to do is check the label: every instrument is signed, numbered, and dated. The date on the label is the day I actually closed the corpus, so, perhaps a few weeks prior to final completion, but no more than that. I also may switch back to a yellow varnish at some point, to shift the color back toward gold, rather than just a red-brown. And, occasionally, I have stripped everything back off and started over. As the original maker, I have that option. and, invariably, the result the second time was far better. 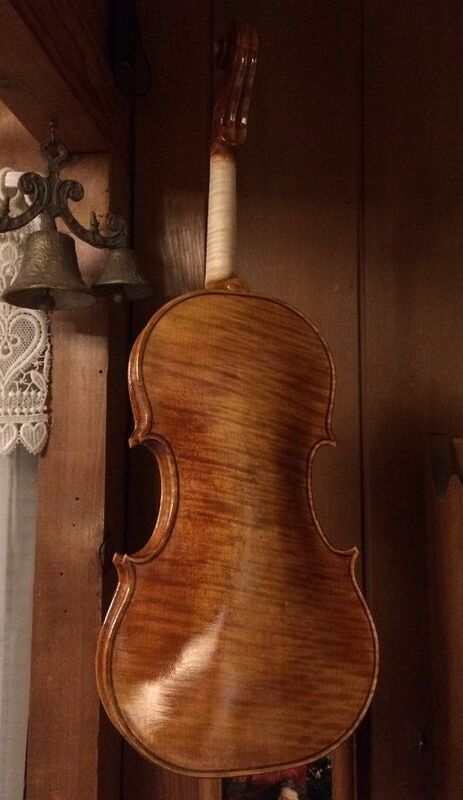 I will post more varnish photos as the violin nears completion. 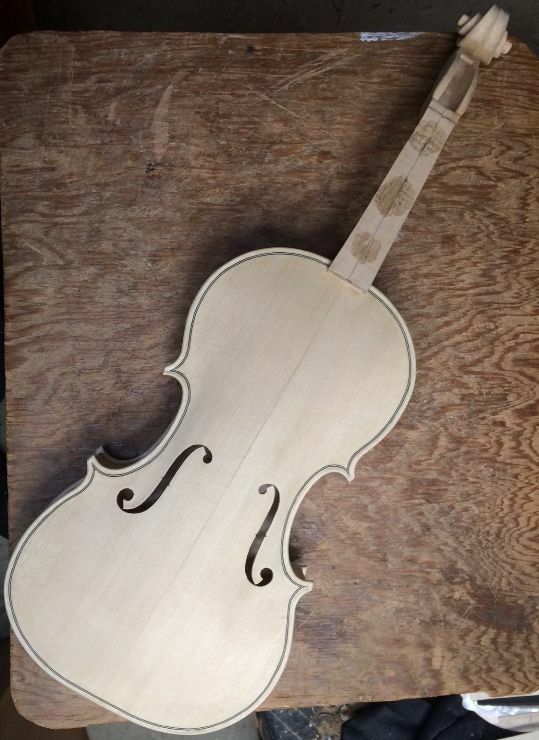 Once the varnishing is complete, I will replace the Fingerboard and begin the final fittings and set-up of the violin. Hopefully, all of that will be covered in the next post.